There's no denying it: one of the greatest advantages of being a member of the British royal family is having access to some of the most blindingly beautiful pieces of jewelry in the world. For a reception held at Buckingham Palace in honor of Prince Charles's 70th birthday, both Kate Middleton and Meghan Markle wore breathtaking pendant earrings — and while we may not have had the chance to take a peek at their gowns, their jewels were enough to make us swoon. For the occasion, the Duchess of Sussex opted for a gorgeous pair of delicate diamond drop earrings, which were perfectly on show thanks to her elegant updo. 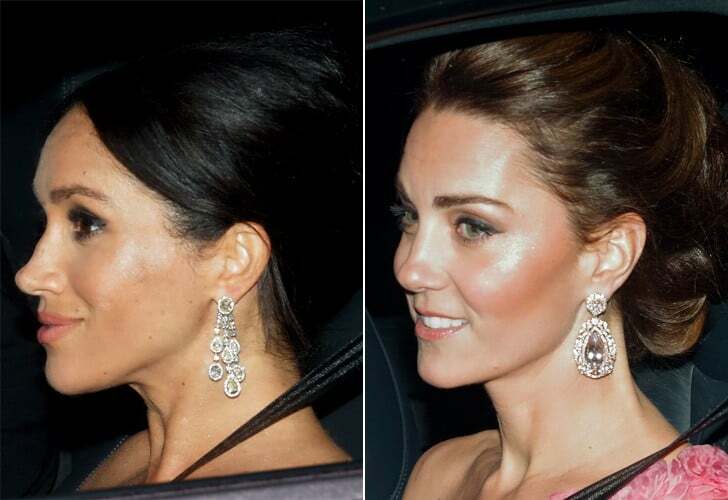 As for the Duchess of Cambridge, she chose a dazzling pair of chandelier earrings, which she previously wore in 2017 when she attended the BAFTA Awards in London. Read on to get a closer look at Kate and Meghan's stunning jewels, then shop similar options for yourself.